Hey everyone! 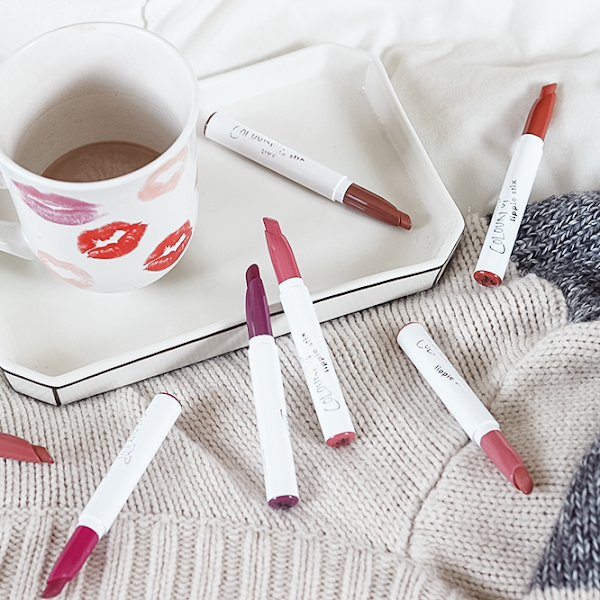 Today, I'll be sharing swatches and reviews of the Crowd Colour Liquid Matte Lip Colours. If you're unfamiliar with Crowd Colour, they are made up of a group of beauty enthusiasts, event organizers and web developers with over 15 years experience in the beauty game. 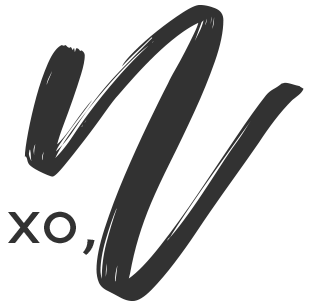 They're mission is to bring beauty products to all communities that are cruelty-free at a great price point. What's really awesome is every time you shop their site, they give 5-10% of each product sale back to your chosen school! 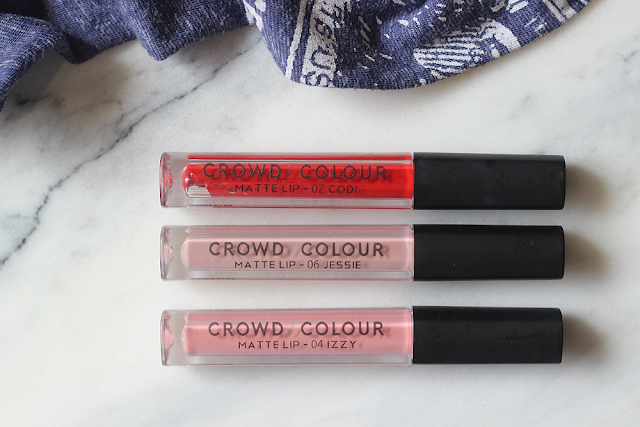 The Crowd Colour Liquid Matte Lip Colours are a collection of six different shades ranging from greige to red and a good mix of colors in between with a "seductive, matte finish". They go for $7.63 (in US dollars if my conversion is correct) for 5 ML of product. 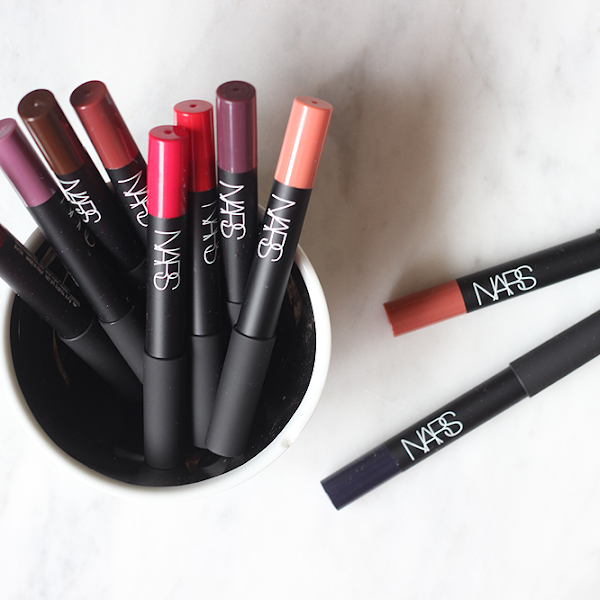 The biggest difference, right off the bat, between this and most other liquid lipsticks is the applicator. My brain kind of went, "What the heck is this?" when I first opened it and then realized it's just a doe foot applicator - but longer. It was still easy to use and I had no issues with application. Codi - a tomato red matte. 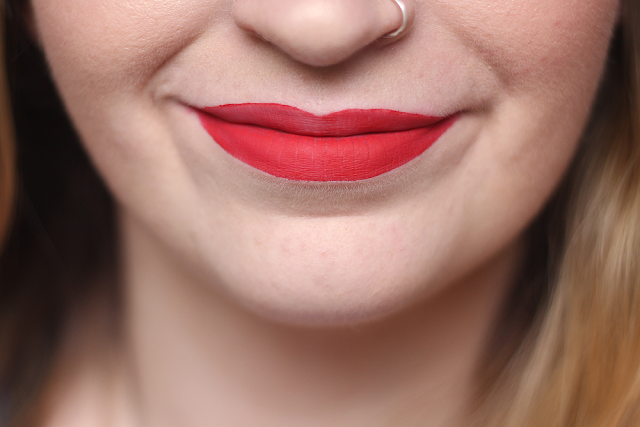 I absolutely love this shade of red but the formula? Not so much. Codi was kind of tricky because the consistency was the same as the others (slightly mousse-y) yet when applied, it seemed sheer in some places. As you can see from the top picture, the top lip shows one coat which was really thin and patchy. The bottom lip shows two coats. I'm not sure why this one was so thin compared to the other two but this does have about a twenty second dry time so you have more than enough time to go back in for another coat to make it more opaque. There was virtually no difference in the feel of it (drying out your lips, cracking, etc.) with two coats versus wearing one opaque coat from Jessie or Izzy so that's a win in my book. I also want to note that these do have a pleasant scent to them but I can't put my finger on what exactly it is - but I like it! Jessie - a light greige matte with pink undertones. 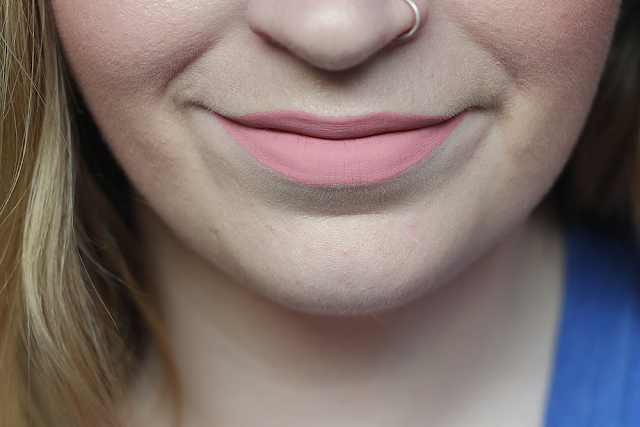 This was initially the first lip colour I tried from the bunch and I was/am still so impressed! 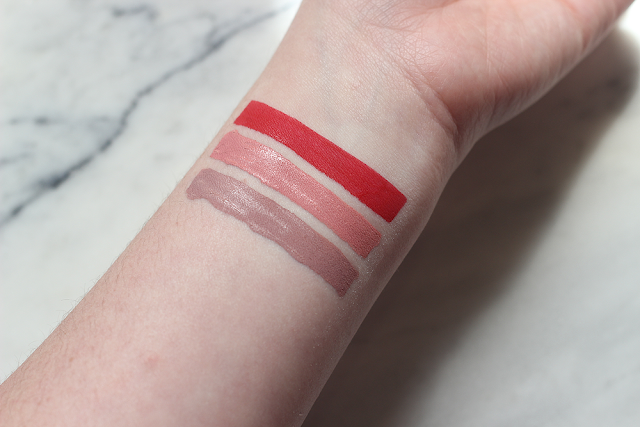 The consistency is light and mousse-y but the coverage is very opaque and even. Dry time was about twenty seconds and left my lips feeling smooth and comfortable. Throughout the day, it only slightly felt drying with no cracking or feathering. 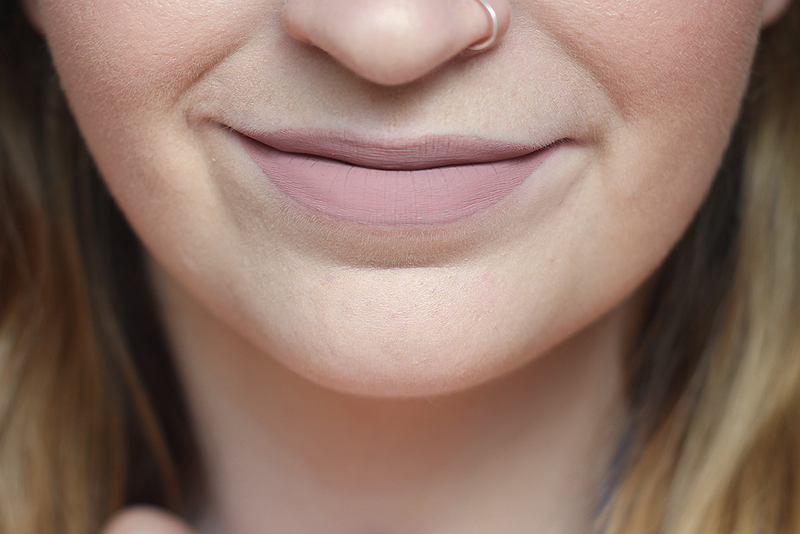 Izzy - a neutral pink matte. Izzy is slightly brighter in person than the picture shows but nevertheless absolutely gorgeous. Like Jessie, it's super smooth and velvety to apply and work with with one swipe giving you full, even opacity. Again, about six hours out, it felt slightly drying but absolutely nothing compared to other liquid lipsticks I've tried. Dry time was about fifteen seconds. Overall: Codi aside, I'm pretty blown away with this formula! I have to admit that this is the first liquid matte lipstick I've tried in a while (maybe ever?) that hasn't gone Sahara-dry on me as the day went on. 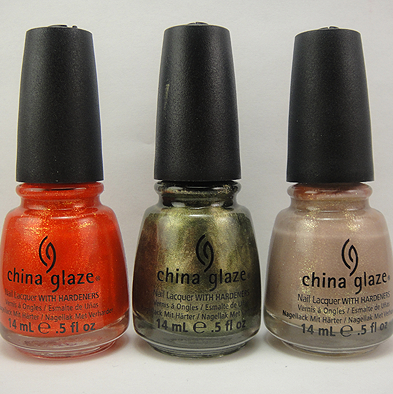 All three were very velvety smooth to apply and both Izzy and Jessie were super opaque with one swipe. Codi was opaque with two swipes; the extra coat did not seem to influence any extra drying or cracking as time went on. There is a scent but it's non-existent once applied. I can't put my finger on what the scent is but it's pleasant and not perfume-y at all. I would highly recommend these! * Products sent for consideration.